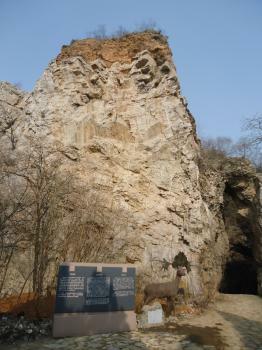 The Peking Man Site at Zhoukoudian is an important finding place of early Asian hominids such as one of the first specimens of Homo erectus, dubbed Peking Man. Over 500.000 years ago, the caves in this limestone area were inhabited by early hominids. They stayed for the next 300.000 years. When this hominid race disappeared, the caves became naturally filled in, and the tools, food scraps and bones in them remained covered by deposits until modern times. The site was discovered in 1921 by the Swede John Gunnar Andersson. Intensive excavation began in 1927. The site yielded nearly 200 pieces of Peking Man fossil (representing around 40 individuals), over 10.000 stone artifacts, several layers of ash as evidence of fire use, and more than 100 specimen of fossil animal. In the Upper Cave, discovered in 1930, the remains of 20.000 to 10.000 years old homo sapiens have been found. Maps were unfolded at my hotel when I asked about how to go to Zhoukoudian. It didn't became very clear if there is a bus going there, so I opted to hire a taxi for a few hours. The driver didn't know how to get there either, but with a map and some directions asked under way we drove to Zhoukoudian. 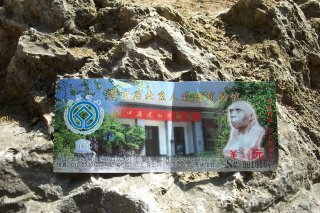 After leaving the expressway, we even encountered a large sign "Peking Man World Heritage Site, Zhoukoudian", accompanied by a picture of Peking Man himself and the Unesco logo. At the end of the road through town, we stumbled upon a parking lot and a ticket office (marked Beijing ren). I was pleased to have made it here, as it looked like not many people ever got here. 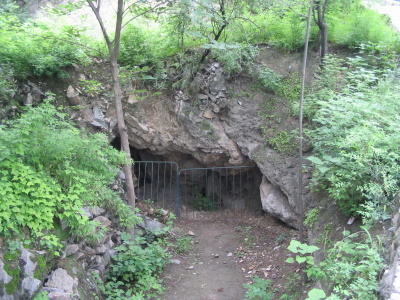 Behind the entrance, following steep steps through the woods, the first place to see is the Peking Man cave (the one that was discovered in 1921). Signs in English detail the findings here. I had the place all to myself, it was so quiet that I expected some prehistoric animal to creep from under the stones. A great place to contemplate man's life during the past 500.000 years though. I walked around the other caves and the interesting museum. The phrase 'Few go to visit Peking Man site anymore' (the title of a Seattle newspaper article you can find in the links section above) didn't prove true today however: about half an hour after I had arrived, some twelve buses filled up the parking lot and released hundreds of screaming schoolchildren. All wearing their school's training suits, they ran around the place filling in questionnaires and picknicking at every possible spot (with the chicken legs their mothers packed them, or a bag from McDonalds). Visited this site in July 2018 as my last WHS in Beijing. I took the metro YanFang Line to the second last station FangShanChengGuan and changed to Fang38 bus which go straight to the entrance of the site. I was told by the front desk that the whole site is under renovation, which has been going for 2 years and no sign of completion. And she even emphasized that the only thing to do inside was to "go hiking". Since I was already there I decided to go in. The main site where they found the skulls was closed down and under construction, but you can still go up the path leading to the observation deck where you can take a glimpse of how it's like in the past. The same path will lead you to more sites and caves. It's recommended to go to the museum first so that you know what kind of fossils were found in the specific sites. There was nobody at the site and I enjoyed my afternoon taking photos without anyone running into it. The museum, on the other hand, has more visitors compare to the site mainly because it's air conditioned on a hot summer. You can find a lot stone tools and animal fossils including a complete tiger fossil. Worth a visit. Do bring food and water if you planned to stay longer as you have to walk a bit to the nearest restaurant or convenient store. I did the Beijing Hotspot sites in a 3.5 days site hopping bonanza. Most sites are well connected and quite touristy. 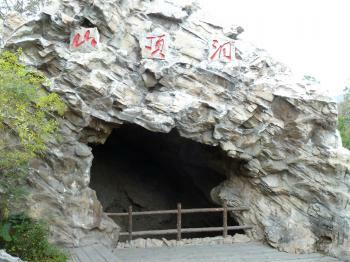 The only site that takes you off the beaten path is the Peking Man Site, a bit at least. While still within the greater Beijing metropolitan area it feels like a world apart from modern Beijing. As is the case with most prehistoric sites, there isn’t all that much to see. The early humans of the area lived in caves close to a river. You can peek into the caves and hike around the hill. But that’s more or less it. On top there is a museum nearby showing some of the findings. To me the thrill of the visit came from venturing out into the country side and understanding how far back human activity in the Beijing area goes. At the time of my visit the metro to Suzhuang was still under construction. You would still need to take a bus from the metro station anyhow, so I would simply take the bus from Beijing. As stated by previous reviews you can go with the 917 or 836. I think the 836 is the express bus with very few stops, so I would take that one. While technically correct that you can get on the bus near the Temple of the Heavenly Gate, I think it’s way simpler to hop on at one of the metro stations along the western bound highway out of town (Liuiliqiao East, Guang'anmen Inner). The data on google maps seems correct. The bus will not take you into town, but drop you off at the town entry. Seeing the site is on the other side of the town you have a bit of walking to do. Alternatively there a local buses running along the main street that you can board. You can see the famous Marco Polo bridge from the highway. I am not sure about the 917 bus. It probaly goes the same (or similar way as bus No 836 which I was proposed to get to Zhoukoudian - initially I took bus 917 but they told me to change into 836). From Tianqiao bus stop (I dont call it station - it's just a stop on a street) you shoud reach place called Zhou Kou Cun Lukou - no worry, bus driver will show you the place, from there it is just 2 km from Zhoukoudian (straight road). The whole area is well marked, with all the paths are described in Chineese and English. All the places (cave of first findings, upper cave, museum) are now opened for public. 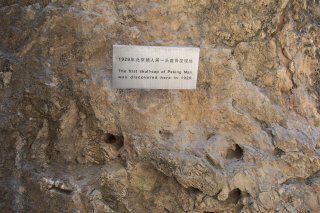 Comparing to other fossil-excavation places in China it is really well maintained and preserved (and described in English). The Peking man museum was very good. An enjoyable day and plenty of data to add to my research project on Homo erectus in China.A bright sunny Decembers day too, all added to the atmosphere. I recommend this site to anyone with an interest in human evolution. There is not much I can add to the existing reviews. If you are in Beijing then this should probably be the lowest priority WHS to head for. Having said that I did have fun squeezing onto a local bus where I was something of a curiosity for the other passengers. The friendly guy next to me saw where I was going and motioned that he would let me know when we got there, he then let me listen to the latest Kanye West album with him whilst listing famous football players. It was a rather enjoyable way to spend the 1.5 hour trip with someone you share no mutual language with. I had a bit of a walk to the site accompanied by another friendly kid who spoke good English and reassured me I was in the right place. On arrival at the site I paid my entrance fee and wandered around. There is a well presented museum has good signs in English, it was a little surprising as I wasn't expecting much. There were informative displays about the scientific breakthroughs that came as a consequence of the finds here and there was some rather swish interactive bits that seemed to keep kids entertained. In terms of the site proper it was a little bit disappointing. One cave was open and I spent about a minute staring into it. I then moved on to the main cave when the bone fragments were found. Unfortunately it was closed off and covered in scaffolding and something that looked like a rudimentary elevator. All in all a pretty underwhelming spectacle. At least I have another site which my friends can rib me about in the pub. The closed cave that used to have a bit of bone in it has joined their illustrious list alongside: the disused quarry, the 14hour round trip to an overgrown field, some mud and their favourite 'the concrete post'. I will admit to enjoying this visit. It isn't the most impressive spectacle, however taking the plunge and getting to this site by local transport was a rewarding way to escape the traditional Beijing tourist circuit, and surprisingly it left me with an appreciation of Kanye West, who would have thought that would be one of the trips outcomes. We all grow up with a vague memory of a “Peking Man” entry in our home or school encyclopaedias. Despite that, in 4 previous visits to Beijing, we had not, given all the other attractions in and around that city, been bothered to make the c 50kms journey out to the site of its finding. In autumn 2005 we put that right – I can’t say we were expecting a lot and to be truthful we didn’t get it either and could not recommend giving it a higher priority than we have done! The site is situated where the plains give way to limestone hills and a number of caves there have been excavated since 1921. It came as a surprise to discover that most of them had in fact been gradually filled in by natural processes (and presumably also the results of use by humans?) over the millennia and the main “cave” (photo) provides a nice example of the various strata which have been excavated to unearth the remains of “human” habitation going back around 500,000 years (some of the discoveries are as recent as 18000 years old showing a long period of human use). The museum at the site contains some casts of the remains and another surprise was to discover that most of the most important early discoveries were lost in the chaos following WWII – possibly in transit to the USA and that casts are all we now have. Some enormous “Bronzes” of the skull adorn the site to make up for the lack of more tangible authentic remains! 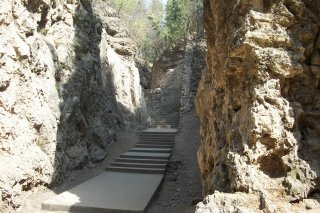 If you do decide to visit the place you will need around 4 hours to/from Beijing including an hour to walk the trail to various caves and visit the museum. We took a taxi to/from our hotel for the afternoon but it is possible to do it by bus. These start at the Tianquiao Bus Station west of Tiantan and run along Guang’an Lu just south of Beijing West Railway station. Bus No 917 seemed to run every few minutes but only goes as far as the town of Fangshan a few kms short of Zhoukoudan from where another bus or taxi should be easy. It is likely however that the less frequent bus No 971 goes all the way. Good luck! Protective Shelters: "..the government built a shelter covering some 3,700 square meters around the cave. The protective shelter is an environmental-friendly iron structure with plants on the roof and a series of high-tech systems in place to monitor and protect the cave. " 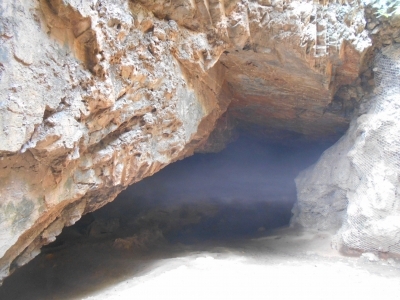 "Cave Man" sites: " Adequate water supplies and natural limestone caves in this area provided an optimal survival environment for early humans..... So far, ancient human fossils, cultural remains and animal fossils from 23 localities within the property dating from 5 million years ago to 10,000 years ago have been discovered by scientists. These include the remains of Homo erectus pekinensis, who lived in the Middle Pleistocene (700,000 to 200,000 years ago), archaic Homo sapiens of about 200,000–100,000 years ago and Homo sapiens sapiens dating back to 30,000 years ago. At the same time, fossils of hundreds of animal species, over 100,000 pieces of stone tools and evidence (including hearths, ash deposits and burnt bones) of Peking Man using fire have been discovered. 102 Community Members have visited.